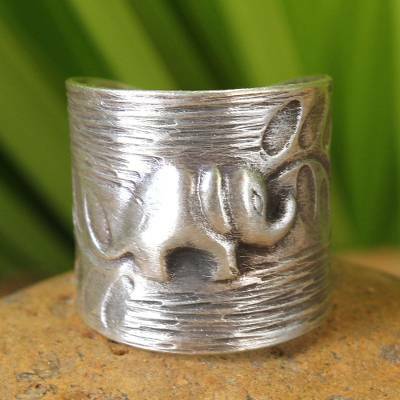 Fair Trade Elephant Theme Sterling Silver Wrap Ring, "Thai Forest Elephant"
A proud little elephant is king of the forest on this handcrafted ring. From Achara in Thailand, the whimsical and charming design is thoroughly contemporary. You can find sterling silver wrap ring 'Thai Forest Elephant' by Achara in jewelry categories such as Animal Themed Rings, No Stone Rings, Silver Rings, Sterling Silver Rings and Wrap Rings. Enjoy exploring these sections for other Novica treasures. Very nice that this is slightly adjustable, gives more flexibility. This ring is an adjustable wrap, it is easy to wear, and a fun accessory for any outfit! I am thrilled to death to have it, I love wearing it and telling people that it was hand made! By far my favorite ring ever! Beautifully crafted, the size is just right if you like rings that really show off! I have NEVER removed this ring since I received it! Works with all other jewelry. It has become my personal statement! "Way better than the photo"
This is a beautiful ring. It looks like a very expensive ring when you receive it and get to see it for yourself. The craftsmanship is beautifully well done. Well worth the money!!!!! The ring is super cute and seems sturdy. Not sure why they request a ring size when the ring is open in the back. Look forward to wearing it for many years. I bought this ring for myself. I love the outline of the little elephant. I also like this ring because I can adjust it. This ring deserves 10 stars plus. I absolutely love my ring . Designed well! I bought this to go with my beautiful matching cuff. I can't seem to go wrong with Novica. I buy for myself & for presents. There is no need to go to any other site. I'm always very expressed. "Awesome but do order size up"